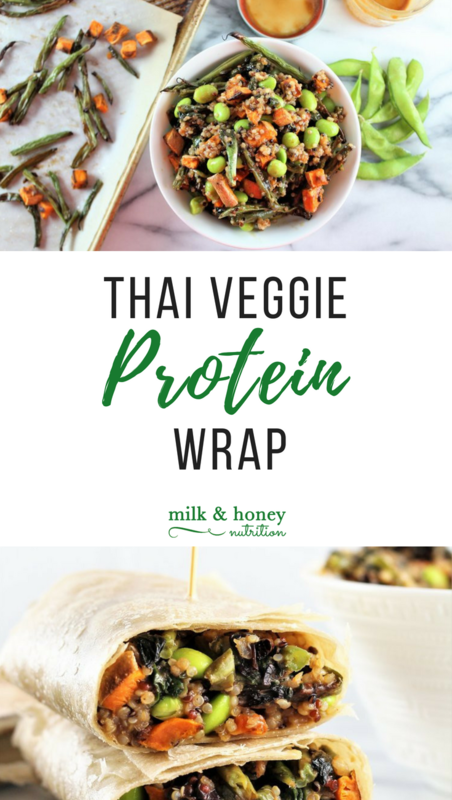 These Thai Veggie Protein Wraps are the perfect way to say farewell to summer... because they can be enjoyed all year round! This recipe is so versatile and can be served as a warm salad, cold salad, or as a wrap. It's even great as a relish on top of salmon or turkey burgers. Inspiration for these Thai Veggie Protein Wraps came from a combination of a previous recipe I'd done this past Spring (Thai Veggie Pizzas), and the new frozen edamame pods available at Sprouts Farmers Market. I love a good plant based source of protein and these little pods are great to have around for a high quality protein and snack that also packs a healthy dose of fiber. And did you know edamame is a great way to get your kids experimenting in the kitchen too? I could easily have bought Frozen Edamame Beans already out of their pods (which Sprouts Farmers Market also sells), but letting my girls pop the beans out is so much fun for them. It's a great way to expose them to a new food and great for that still developing hand-eye coordination! This post was sponsored by Sprouts Farmers Market. All ideas and thoughts are my own. Preheat your oven to 400 degrees. Add quinoa and water to a small pot and bring to a boil. Reduce heat and let it simmer for 15 minutes, or until all of the water has been absorbed. Meanwhile, spread the diced sweet potato and sliced green beans on a parchment lined baking sheet. Bake for 25-30 minutes or until fully roasted. Next, heat the frozen edamame pods in the microwave following the instructions on the package. Pop the beans out of the pods and reserve them for later. Once the quinoa is cooked through, remove the pot from the heat and stir in the spring mix lettuce. It will wilt/cook from the residual heat of the quinoa. Finally, make the Thai Honey Peanut Sauce. Combine the remaining ingredients (except for the tortillas) in a 4-6 oz glass jar. Secure the lid and shake well to combine. In a large bowl, combine the quinoa/spring mix, roasted sweet potatoes and green beans, edamame beans, and sauce. Stir to combine. Enjoy as is for a cold or warm summer salad, or use whole grain tortillas to make wraps. Enjoy! Check out these other great Lunch and Dinner recipes!